Rent the best boat charter in the BVI through Nicholson Yacht Charter and Services, and it could be one of the best escapades that you won’t ever forget. Since 1949, Nicholson Yacht Charter and Services specialize in boat charters, luxury sailing, motor yacht charter vacations, catamarans, scuba diving charters and travel in the Caribbean. With us, your choice is what will be made possible. Choose the perfect boat charter to use for your Caribbean cruise. You will be captivated and amazed in what the British Virgin Islands have to offer. With a captain, crew and chef on board, your experience will be the most memorable and exquisite. We offer the best motor boats, catamarans, private luxury yacht and other vessels that you can use for your private sailing in the BVI. Regardless of what your request may be, it’s our job to make it possible. From a couple of days of skippered sailboat to rent or a luxurious week-long sailing in the Caribbean, Nicholson Yacht Charter and Services is here to make your dream vacation come true. First thing you need to get in touch with Nicholson Charters to book your tour. We can offer you all of our available boats, tours and services – everything that we offer are carefully inspected in order to bring only the best for our clients. Based on your idea of a vacation, we will initially propose three to four yachts that you might like. If you don’t want any of the proposed boats, you can tell us in detail what you would like and we will find it for you. Basically, you need to figure out what you would like to do in your charter. Are you mostly interested in adventure or different water sports? How about fishing monster fishes? Are you renting a boat to throw a party? Would you rather sail and enjoy the gentle waves of the ocean? What you want to do will determine whether to get a motor yacht or sail. It is advisable that you plan ahead of time. Planning ahead will be helpful especially if the dates when you would like to charter will fall on huge holidays because people normally book on those dates. Therefore booking four to six months prior is ideal. However, at Nicholson Charters, we often experience booking clients that on the spot and we’ve been successful in getting our clients’ desired boat and charter location of their choice even in such a short notice. 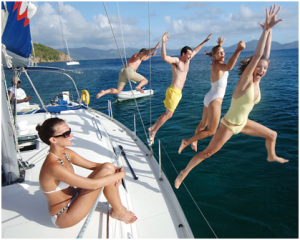 Sail with your friends, family and loved ones in the Caribbean with the help of Nicholson Yacht Charter and Services. Chartering the British Virgin Islands by boat is truly an exhilarating adventure that will open doors for unforgettable memories. 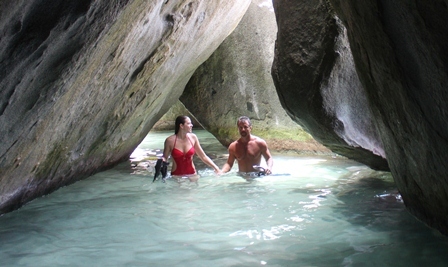 The BVI is filled with the most interesting locations and untouched species unlike anything you’ve seen before. Let the BVI pristine shores, blue skies and crystal clear water take you to paradise. Whether you’re with a special someone, your whole family, your friends or your colleagues, Nicholson Yacht Charters and Services will make your dream vacation possible!